The disaster might pose an opportunity for Australia and New Zealand to bring Fiji in out of the diplomatic cold. 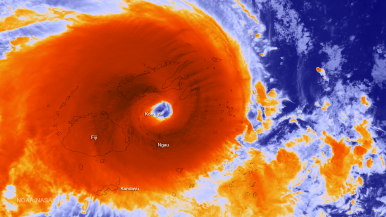 A month and a half ago Fiji experienced the second-strongest cyclone to ever make landfall. According to the Fijian government, Cyclone Winston took 44 lives, and directly and severally impacted around 350,000 Fijians, over a third of the population of the island nation. The estimated damage from the cyclone is around $485 million. In the early morning of April 6, Cyclone Zena, a category 3 tropical cyclone, passed just south of the islands. While Fiji avoided a direct hit, Zena still brought heavy rainfall and has caused flooding, potentially hampering recovery efforts. The areas of main concern stemming from Cyclone Winston, aside from the obvious human casualties and injuries, have been agricultural devastation — sugar cane, alongside tourism, remains Fiji’s largest source of foreign exchange — and the risk of communicable diseases. There is also the inevitable economic stagnation that will result from both private and public resources being redirected toward the cleaning up and rebuilding of the affected regions. The cyclone has become a significant test of the restoration of Fiji to the South Pacific regional infrastructure. In particular, the rapid response of Australia to the situation was important for both humanitarian reasons, and to exert its influence as the region’s major power. With these goals in mind, Australia immediately released US$3.77 million worth of emergency response supplies to those in evacuation centers and those in most need, identified through the Red Cross, UN agencies, and various NGOs. Subsequently, Australia also provided an additional US$7.5 million to supply food, clean water, shelter, and hygiene, as the initial funds to begin the process of restoring health and education services to the affected communities. Furthermore, significant defense force assets, including the HMAS Canberra — a Landing Helicopter Dock ship — surveillance aircraft, helicopters, and a number of personnel were deployed to assist with logistics and to deliver humanitarian aid. Two Australian Medical Assistance Teams (AUSMAT) were also deployed to needed areas to provide medical assistance and assist Fijian health officials undertake assessments of their requirements. Adding to the weight of Australia’s response was the visit to Fiji by Foreign Minister Julie Bishop on March 13 and 14. Australia’s Department of Foreign Affairs and Trade (DFAT) has also commenced work on a longer term recovery package in conjunction with needs identified by Fijian authorities. The relationship between Australia and Fiji has, according to DFAT, been on a “positive trajectory” since Fiji’s elections in September 2014. However, the current elected government is still led by Prime Minister and Naval Commodore Frank Bainimarama, which remains a potential stumbling block to completely normalized relations, or at least to warm senior government relations. In 2000, after businessman George Speight held the Fijian Cabinet hostage, Bainimarama declared martial law, and took executive power. The subsequent six years of constitutional wrangling led to another coup, again headed by Bainimarama. Due to the pair of coups and the length of time to restore democracy, tensions between Bainimarama and the Australian and New Zealand governments have persisted. Civil society links, however, have remained very strong between Fiji and the two regional powers. Both Australia and New Zealand have large Fijian diasporas, and Fiji has always been a major tourist destination, even throughout its political troubles and military coups. Never has the country been deemed dangerous to visitors. After the September 2014 election, Australia lifted all remaining restrictions on formal governmental engagement with Fiji, including resuming Fiji’s involvement in the Defense Cooperation Program. The Commonwealth Ministerial Action Group fully lifted Fiji’s suspension from the Commonwealth, and the Pacific Island Forum Secretariat announced the lifting of Fiji’s suspension from the Pacific Islands Forum on October 22, 2014. These measures have greatly increased the ability of Australia, and other Pacific nations, to coordinate their aid responses and roll-outs with the Fijian Government. This is a positive for the people affected by the disaster, but also for the restoration of broader and ongoing regional cooperation. It’s also a chance for Australia to re-engage more proactively with the country after almost 15 years of isolation. The recent donation of arms to Fiji from Russia could be cause for significant concerns for Australia. It may indicate that Fiji is seeking realign itself with countries which are less concerned with the state of its democracy. Growing Chinese influence in the South Pacific is a noted policy concern for the Australian government. It may seem crass to point to the strategic opportunities that arise from a natural disaster like Cyclone Winston. But this event has the potential to bring Fiji fully back in from its regional isolation, and especially back into the Australian-New Zealand sphere of influence. The Australian government would be wise to be aware that assisting with the humanitarian needs of Fiji, as well as its structural and economic restoration, are implicit in this outcome. Per capita since 1970, Fiji has contributed more personnel to UN Peacekeeping missions than any other state.